Thought to lovingly nurture the child within - and help us love and accept the skin we’re in - this enchanting crystal suggests you may find yourself feeling very emotional this week. Painful memories from the past - and fears about losing the people you love - may leave you feeling very tearful, and you may find yourself mourning the loss or absence of a friend or loved one too. Nurture your heart and mind - and leave your worries behind - by keeping a Pink Tourmaline by your side. Captivating people’s hearts for centuries, this beautiful crystal suggests you may find yourself feeling slightly suffocated by a friend or loved one’s needy behaviour this week. Late-night calls from friends and family members may leave you feeling very drained, and someone’s attention-seeking behaviour could really drive you up the wall too. Prevent their neediness from affecting your happiness by keeping a Sunstone nearby. This powerfully protective crystal is thought to help with everything - from keeping you calm and protecting your family, to boosting your confidence and shielding you from envy! Synonymous with the Tuscan Goddess of Witches, Aradia - who is thought to have spent her lifetime protecting others from injustice and inequality - this beautiful crystal suggests you may need to protect a friend, colleague or loved one from someone’s cruel or controlling behaviour this week. This stunning crystal is often associated with the Chinese Health Goddess Ho Hsien Ku, who is thought to have been granted eternal health and happiness after eating a piece of Muscovite! Like this beautiful goddess - who so selflessly spent her days gathering fruit for her mum - this enchanting crystal helps you love and nurture your body and mind (like a mother nurturing a child), and will help you cherish yourself as much as Ho Hsien Ku cherished her mum this week. 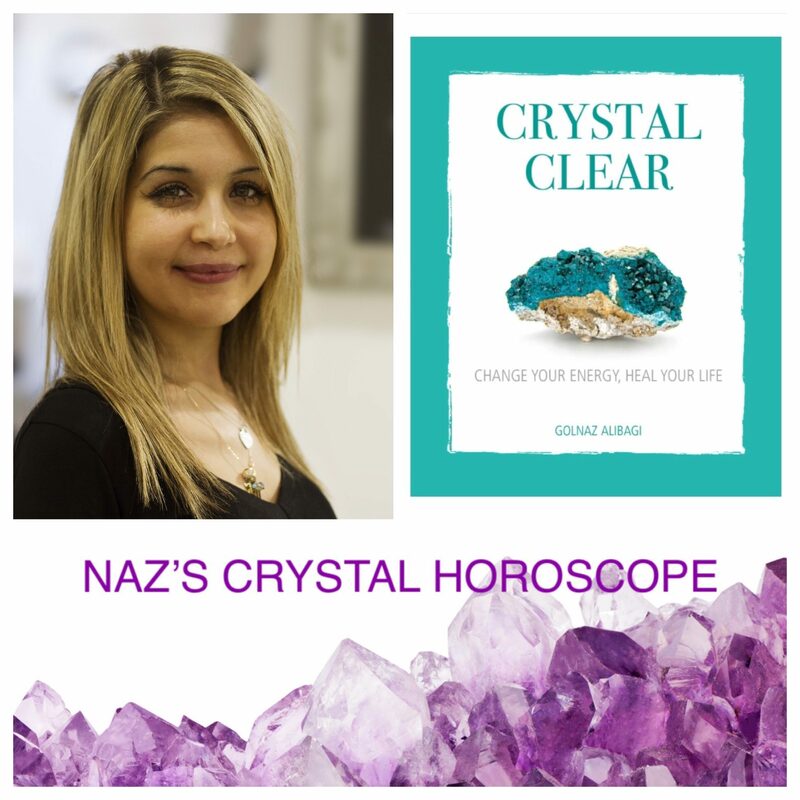 Captivating the world with its beauty for centuries, this mesmerising crystal is thought to help with everything - from boosting your love life and protecting your family, to healing your heart and attracting money! Known as the ‘stone of successful love’, it suggests there could be some very exciting news about two people you love this week. Pregnancies, proposals and wedding invitations are all likely, and love could blossom between two people you know too. Prized for centuries, this stunning crystal has captured the hearts of some of the world’s greatest icons - including Princess Diana - and was once thought to lose its sparkle around guilty people. Synonymous with truth, honesty and friendship, it suggests a friend, colleague or family member’s guilty behaviour could leave you feeling very suspicious this week. Protect yourself from their negative energy - and bathe your heart in love and serenity - by keeping a Sapphire nearby. Synonymous with the beautiful Greek Goddess of the Moon, Selene, this mesmerising crystal suggests you could hear some shocking gossip about a friend or loved one this week. Shocking revelations about friends, colleagues and family members may leave you feeling very unsettled, and someone from the past could re-enter your life too. Protect yourself from all the drama around you by keeping a Moonstone in your home, or holding one by your heart. This bewitching crystal has captured people’s hearts since the late 18th century, and is often associated with the Roman Goddess of Forgiveness, Clementia. Like this kind goddess - who is thought to have carried an olive branch wherever she went - this enchanting crystal suggests you may need to apologise to a friend or loved one for your past behaviour this week. Rebuild the bond between you - and leave the past behind you - by keeping a Rhodonite nearby. Adored for centuries, this beautiful crystal suggests you may find yourself feeling very popular with the people around you this week. Loving messages from friends, colleagues and family members may leave you feeling very blessed, and there could be an exciting opportunity for you travel abroad too. Nurture the bonds around you - and celebrate the love and happiness surrounding you - by placing a Jasper by a photo of you and your loved ones, or holding one by your heart. Like the beautiful flower it’s named after - which so devotedly twists and turns to face the sun (like a sunflower) - this magical crystal is often associated with the heartbreaking story of a young girl, who fell in love with the Sun God, Helios. Bewitched by his beauty, she’s thought to have watched him pass the Sun each day, until she eventually turned into a Heliotrope flower. Synonymous with love, it suggests you may find yourself missing someone too this week.